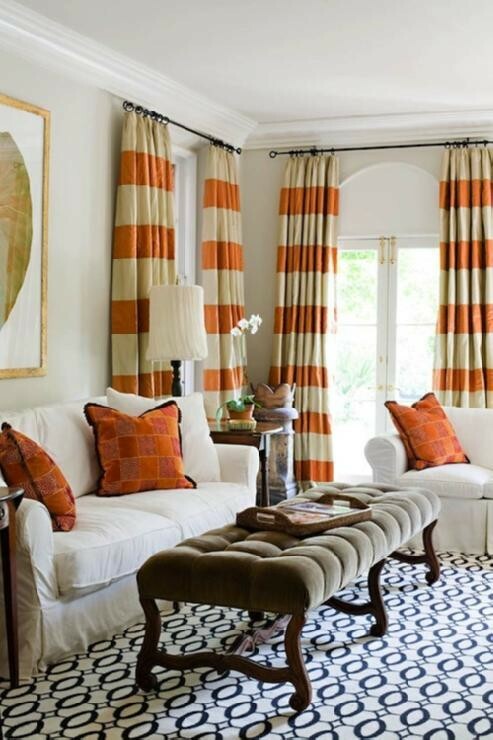 DESIGN 101: WINDOW TREATMENTS - FABRIC & DETAILS! Design 101 this month is all about windows! In the last two weeks, we've discussed details for choosing drapery along with shades, blinds, and shutters. Now that you've determined what kind of window treatment is right for your space, you'll need to pick fabric and decide if you want to add any details. Light affects color, and we're hoping you get plenty of light through your windows! Take a few fabric swatches home and see how you like them during the day and at night. Seasons affect color. Now that we're entering fall, you may have noticed all of the fall decor exhibited in furniture showroom windows. Deep, rich colors look great in colder months, but will they look great once spring comes around? Consider a color that you will love all year round, and one that matches the decor of your room. Don't be afraid to go bold! There's no rule that window treatments have to be boring. Sure, a little bit of color goes a long way, but you can try a neutral or soft colored shade and add some color in the details (as shown below!). Still in doubt? Try going a little lighter than your walls. This helps emphasis your windows as a light source, and frames your view so that your eye is drawn to what's on the other side of the window. If you're using an allover pattern, stand back from the material to see how it looks from far away. Is the pattern too subtle? Is it overpowering the window? Some small scaled allover patterns, such as polka dots, can even give the window a textured look which can be a nice detail without being overbearing. Stripes offer a simplicity that works in many different atmospheres, offering a tailored detail . 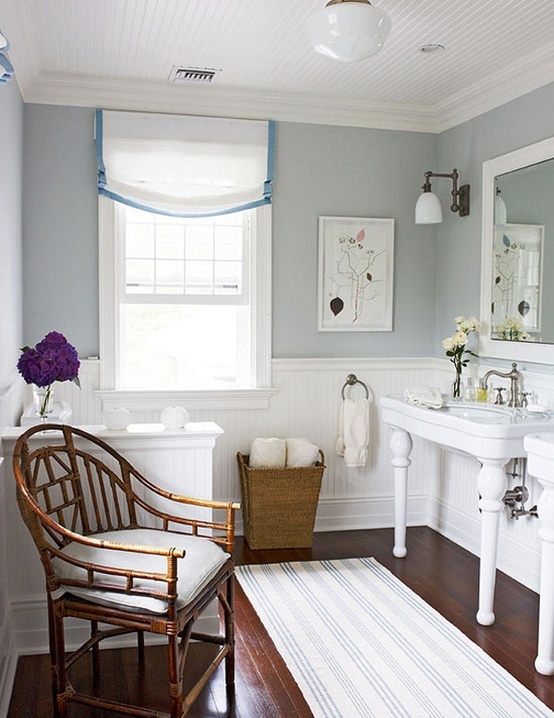 Small stripes will look finer and blend more from a distance, where large stripes will offer a bolder look. If you're using a floral pattern, consider a larger scale motif for drapery, where you will read the full pattern, and a smaller motif for shades. The same rule goes for other patterns such as geometric, abstract, or the little farm animals on kid's windows! Perhaps you don't want any pattern! Texture is a terrific way to add interest to your windows. Try a woven linen fabric or a silk dupioni for a subtle but elegant detail. Synthetic: We're all for using natural materials in your home, but sometimes using a synthetic is the right way to go. We almost always use synthetic fabrics for window treatment linings, as they can often withstand direct sunlight better than natural materials. That way they will keep your window treatments looking in tip top shape! If you have windows that get intense light, you may even consider using a synthetic fabric for the entire window treatment. Trevira is are our favorite! Cotton: Cotton is available in a wide variety of textures, patterns, and colors, making it extremely versatile. It can be finished using a satin weave, for a more formal look, or can be finished in a plain weave for a more casual look. If you're looking for a very casual look, try a lightweight lining. This works especially well for drapery. For a more formal look, add an interlining or use a heaver lining to make the cotton sturdier and tailored. Linen: Linen is one of our "go-to" fabrics because it can be used for a variety of applications. A linen that has a tighter weave will look more refined, while a linen with an open weave will look more casual. Linens are available in a variety of pattern as well, which can add both texture and visual interest to your windows. You can use a linen sheer to add softness to a window where privacy and light filtering aren't an issue, or a heavier linen for drapery panels and roman shades. Just be aware that linen is moisture-absorbent, so we always recommend lining it so that your window treatments keep their shape. Especially if you're near the beach! Wool: You might think of wool as an odd choice for a window treatment, but think of how great a fine wool hangs on men's trousers. Wool is durable, holds color well, and create a cozy detail to your windows. There are a lot of different kinds of wool depending on what animal they come from, and each has it's own texture and characteristics. Like linen, wool absorbs moisture, so make sure to line it. Silk: Silk makes for beautiful drapery and roman shades. It is refined, formal, and comes in a variety of colors from creamy off whites to brilliant jewel tones. To dress it down, try dupioni silk, which has slubs running through it. Be careful where you put silk window treatments, however. Direct sunlight will eat away and destroy silk, leaving you with an expensive lesson learned! 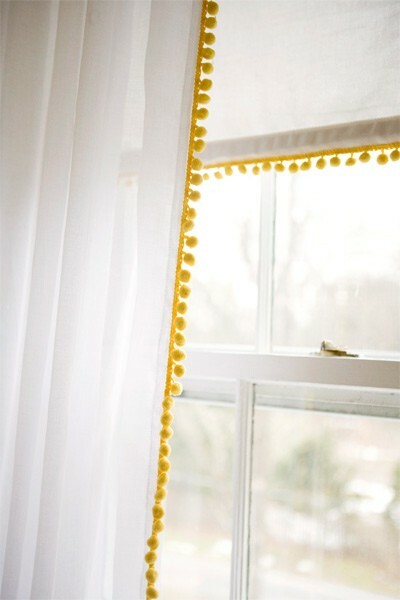 Always line your silk window treatments to be safe. There are an endless amount of details you can add to your window treatments to give them a unique look. Below are some of our favorites, but if you have your own, please send us your ideas! We'd love to feature our reader's favorites! This valance is tailored, but not overly bold, with a simple pleat and trim detail. This valance adds a bit of grace and femininity with a scalloped edge. Flat roman shades are framed out in a tape trim. 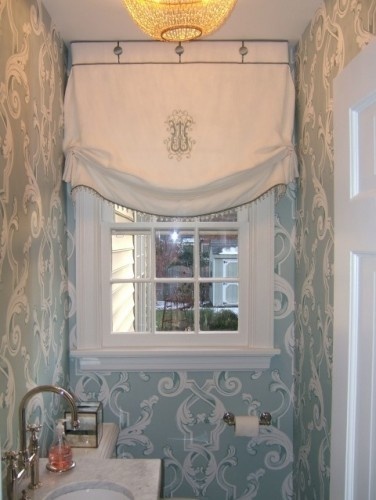 A relaxed roman shade can also be framed in a trim. This relaxed roman shade is a touch fancier with a beaded trim, buttons across the header, and an embroidered monogram. Trim on these tulip shades help give them a more casual look. A Greek Key makes a versatile trim detail that makes a big visual impact. Trims don't have to be flat! We like trims made of tassels, pom-poms, shells, and more. Trim can also be used on pattern! Stripes on window treatments should always align for a finished look. Stripes offer a bolder look when they are large scaled. Patterns should also align on window treatments. Sometimes no detail is best. A subtle color and beautifully tailored drapery panels say it all! Sometimes the interesting detail comes from the lack of adding detail at all! The brush fringe adds a traditional element to this drapery that counteracts the casual heading without any pleating. Have you considered any cool window treatments lately? Let us know, we love to hear from you! Up Next: How to Measure!